Shore Thing - Close to Downtown and 10 Minutes to South Beach. Fresh and Updated. Great Backyard for Grilling and Dining and Nightly Fires - 414 Michigan Ave. 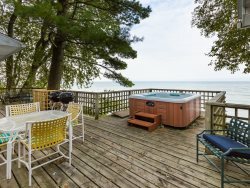 It's a "Shore Thing" to have a fabulous visit to South Haven in this well situated vacation home on Michigan Avenue. Super close to downtown means easy access to the farmers market, morning coffee and baked goods, dining, shopping and of course, ice cream. A short 10 minute walk will have you down on the South Beach on the Lake Michigan coast. Enjoy the day playing in the sand and waves or just chilling with your favorite book. Concessions and bathrooms are handy as well. This remodeled and freshened Cottage is full of character with a modern kitchen complete with a roomy breakfast nook, spacious living and dining areas, a sweet front porch, 3 bedrooms and 2 full baths. One bath is on the main floor for ease of rinsing off after the beach. Full laundry is available on the lower level. The backyard is partially fenced and includes a lovely patio with outdoor dining and grilling as well as a fire pit. A great space to spend a lot of your relaxing stay. Bedroom 1. Upper Level. Queen. Bedroom 2. Upper Level. 2 Twin. Bedroom 3. Upper Level. Queen and Twin Trundle. The team was very helpful and friendly. I appreciated the promptness of their responses - and ease in splitting the fee amongst a few parties. Cure beach house and great for our family. Thank you! Great location! Very comfortable! Loved the large living room with plenty of seating, as well as the large dining room and table. Very nice enclosed porch. A great spot! Great location, and excellent response time. They are around every day of the week to help us.